Terrorism and radicalization seriously threaten the cohesion of societies all over the world. The European Union is aware of the complexity of the challenge. While many actors at different levels are involved, a unique role is recognized for victims of terrorism and their testimonies. This project is composed of a European network-based prevention and learning program. TERRA is a European project supported by the European Commission DG Home Affairs. The objective of TERRA is to reinforce the positive role victims and former terrorists can play in relation to the prevention of radicalisation and providing practical guidance to specific target groups. Target groups and beneficiaries include victims, (potential) terrorists, EU member states and frontline-workers in the field of law-enforcement, rehabilitation, teaching, welfare and social workers, journalists, policy makers, and religious leaders. what is THE terra TOOLKIT? 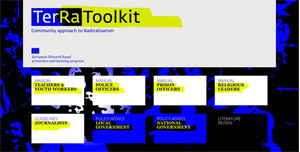 The material you can find on this website has been designed for professionals who come into contact through their work with a population which may be vulnerable to radicalisation. It explains why this subject may be of relevance to you, how you might notice if this issue was developing, and what you can do about it. Manuals which contain a fuller picture of this problem and an approach to solving it, and short fact sheets, can both be downloaded here free of charge. Furthermore you find films with testimonials of victims of terrorism, former radicals and interviews with representative of all the different target groups.